So, you're looking for some host plants to attract butterflies, like monarchs and pipevine swallowtails? You're yearning to see monarch eggs, caterpillars and chrysalids on milkweed. Ditto for the pipevine swallowtails on their host plant, Dutchman's pipe. 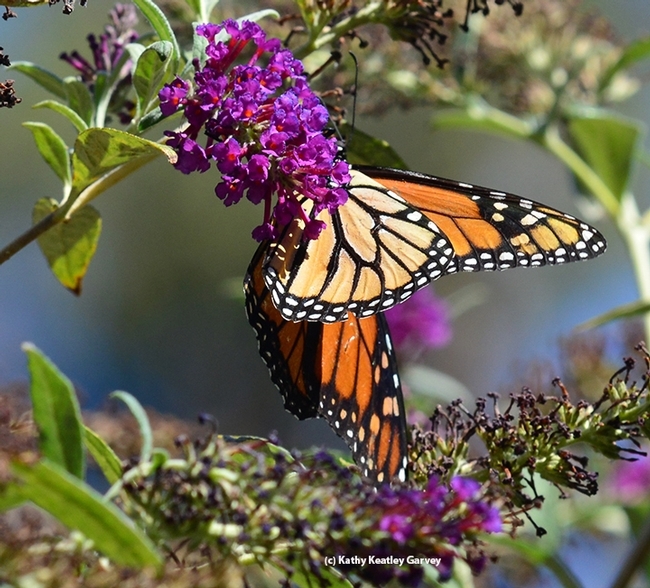 You also want some butterfly bushes and other nectar plants. 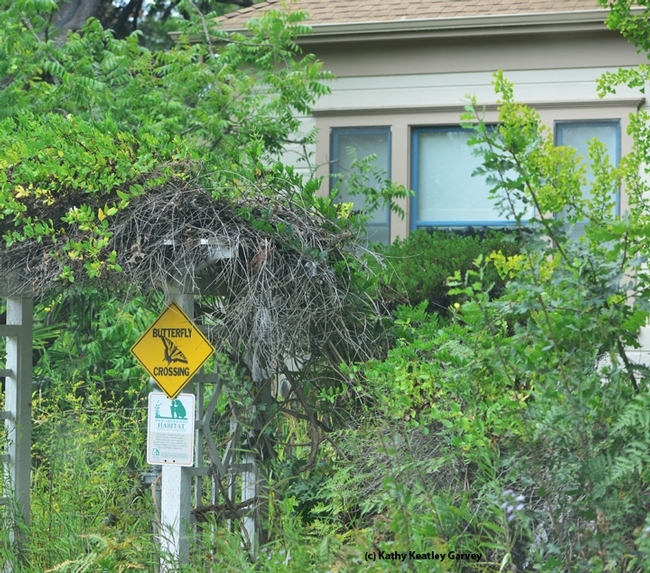 And you're thinking of replacing your drought-stricken lawn with drought-tolerant plants. "We're going to have a lot plants -- over 16,000 – including lots of Arboretum All-Stars in honor of their 10-year anniversary," spokesperson Katie Hetrick told us today. 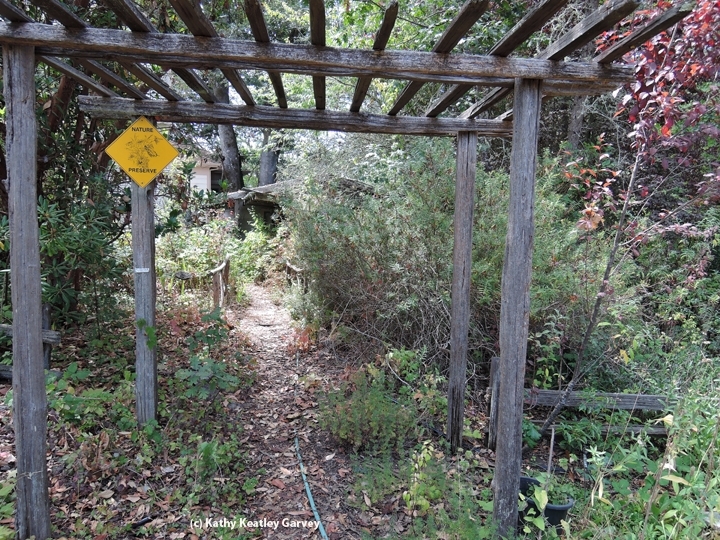 The All-Stars are 100 specially selected plants "that have provided California with a foundation for creating attractive, easy-care landscapes that save water." 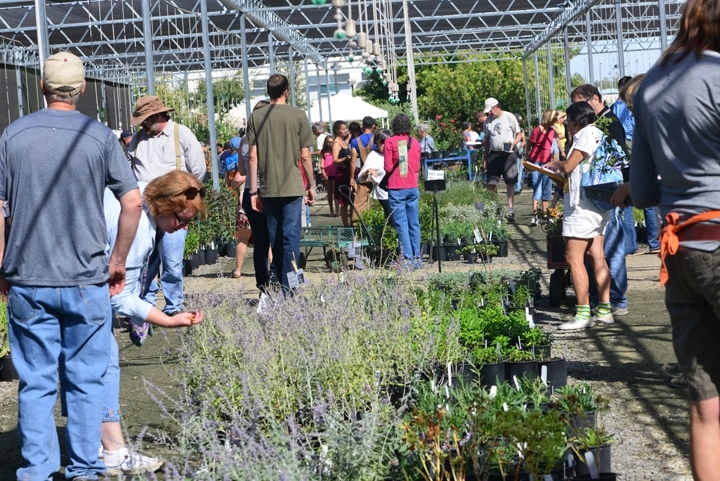 A large selection of Arboretum All-Stars, California natives, and other regionally appropriate plants will be available. The public sale offers benefits for Arboretum members, who can save 10 percent. Non-members can join at the door. For additional information, see benefits of memberships. What's available at the plant sale? Is there a list? Yes, and folks are checking it twice! You can access it on the website or download the PDF. While you're on the campus, you can explore the 100-acre UC Davis Arboretum, a horticultural and cecreational treasure filled with scientific collections, demonstration gardens, educational information and art work. You can walk or bike the trails. Bring your camera. 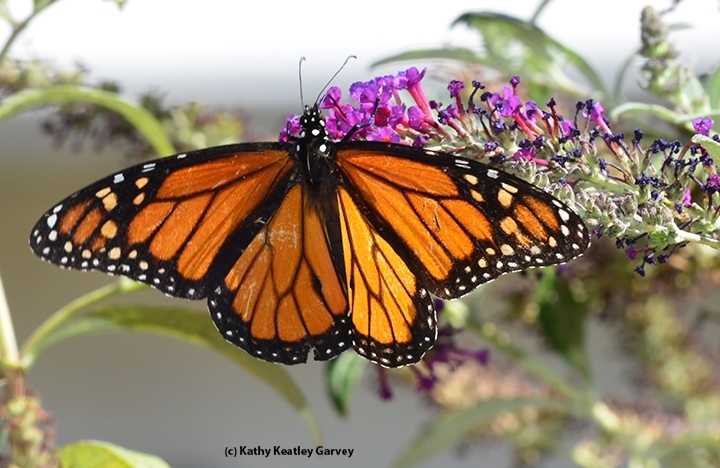 If you're lucky, a monarch will flutter by. It will be a monarch-kind of day. Monarch enthusiasts are eagerly awaiting the "Welcome Back Monarchs Day" on Sunday, Oct. 11 at the Natural Bridges State Park, 2531 West Cliff Drive, Santa Cruz. 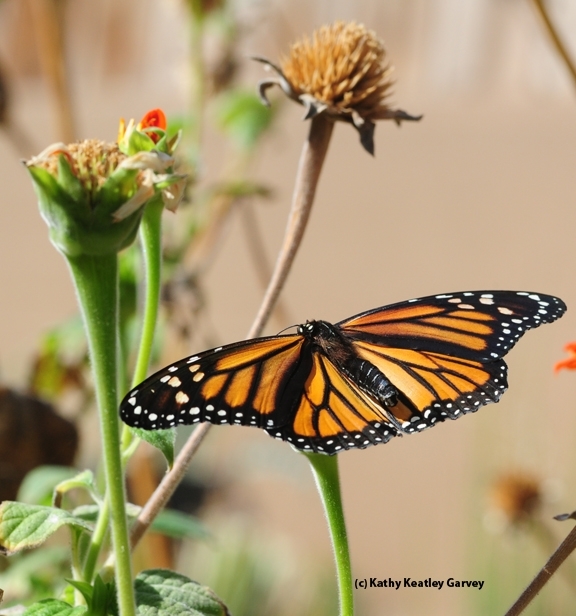 Some 500 monarchs have already arrived to their overwintering habitat, a spokesperson said today. The early birds--err, early butterflies--usually begin arriving in October. They overwinter until about February. The peak season to see them? November. Last Dec. 27 at the Natural Bridges State Park, we saw dozens of monarchs about 80 feet up in the eucalyptus trees. When the sun broke through the trees, assorted birds targeted them, scattering them like mosaic paper kites, much to the awe and aahs of the crowd below. So, Sunday, Oct. 11 is "Welcome Back Monarchs Day" from 11 a.m. to 4 p.m. at the Natural Bridges State Park. There will be arts and crafts, games for the children, and music by "The Mostly Mediocre Musical Monarch Mariposas," or 5 Ms for short. 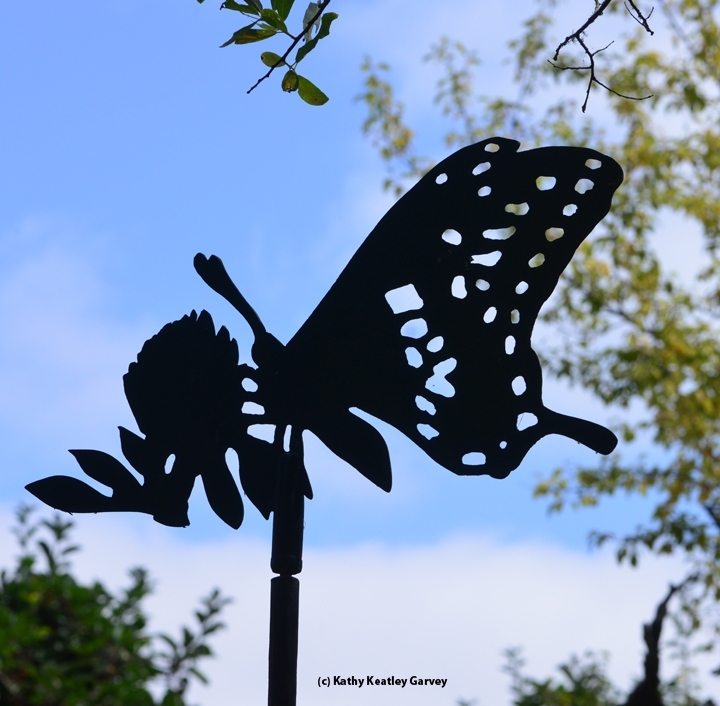 You can visit information booths and learn how to attract butterflies to your garden and how to care for them. Day-use parking is $10. For more information about this special day, contact (831) 423-4609 or access the Friends of Santa Cruz website. Of course, the Natural Bridges State Park and the Pacific Grove Sanctuary are just two of the California coastal areas where monarchs overwinter. 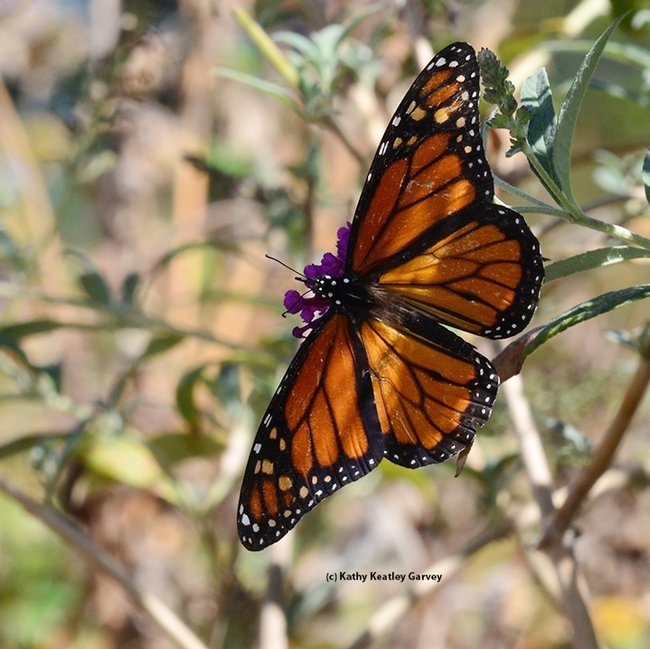 Most monarchs overwinter in Mexico's fir forests. 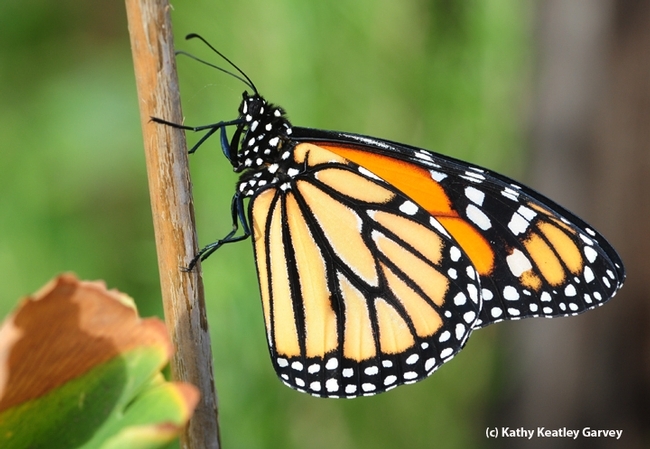 The Bohart Museum of Entomology, University of California, Davis, has a wealth of information about insects, including monarchs (Danaus plexippus) in its fact sheets. "Monarch butterflies are among the largest members of the family Nymphalidae in North America. 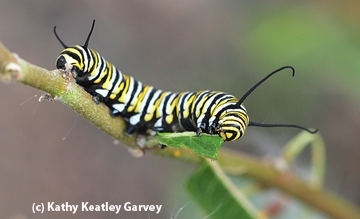 Their caterpillars store toxic chemicals called cardiac glycosides in their bodies from the milkweed they eat. Cardiac glycosides make vertebrates like us quite sick, so don't eat a monarch butterfly or caterpillar if you can help it. The chemicals remain in the adult butterfly bodies as well but tend to be concentrated more in the wings than in the body. Interestingly, cardiac glycosides seem to have very little effect on insect predators and parasites." "The annual North American migration begins as early as August. Populations west of the Rockies migrate to the Pacific Coast with overwintering roosts along the central California coast. One of the best known of these is in Pacific Grove, California. Populations east of the Rockies migrate to central Mexico. Adult monarchs typically only live a couple of months, although they can live up to 5 or 6 months so the individuals that emerge in early summer do not migrate. Each generation takes between 5 and 6 weeks from egg to adult. The last generation of the summer goes into migratory mode. They stop reproducing and fly in a linear fashion to one of the overwintering sites. These individuals generally do not begin reproducing until the following spring in February or March when they leave these sites and move north from the Mexican site or north and east from the Pacific Coast." Welcome back, monarchs! You're now fueling up for mass migration. The Monarchs are on the move. 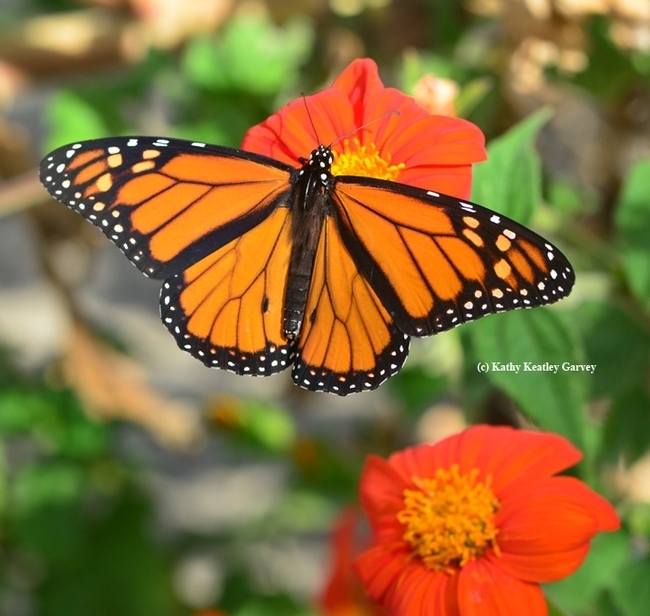 In the late summer and early fall, the Monarchs (Danaus plexippus) head for the California coastline or central Mexico to overwinter. 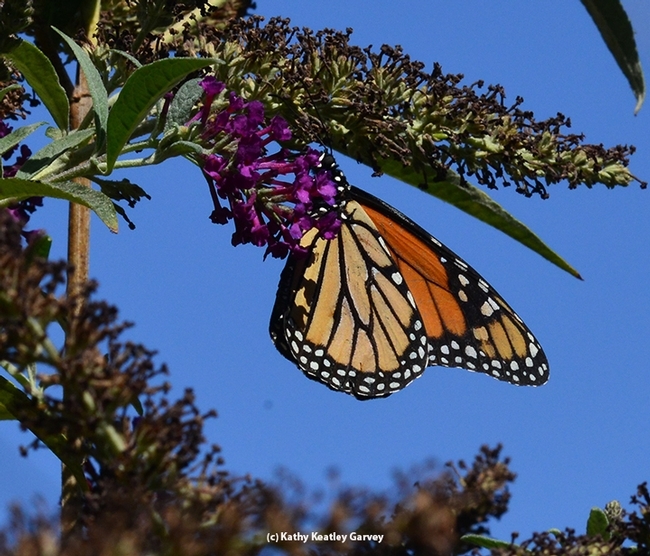 "Monarchs west of the Rocky Mountains travel to small groves of trees along the California coast," according to Monarchwatch.org. "Those east of the Rocky Mountains fly farther south to the forests high in the mountains of Mexico. The Monarch's migration is driven by seasonal changes. 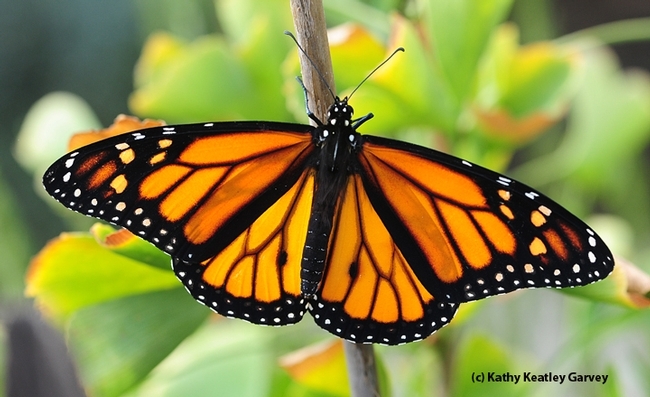 Daylength and temperature changes influence the movement of the Monarch." See map. 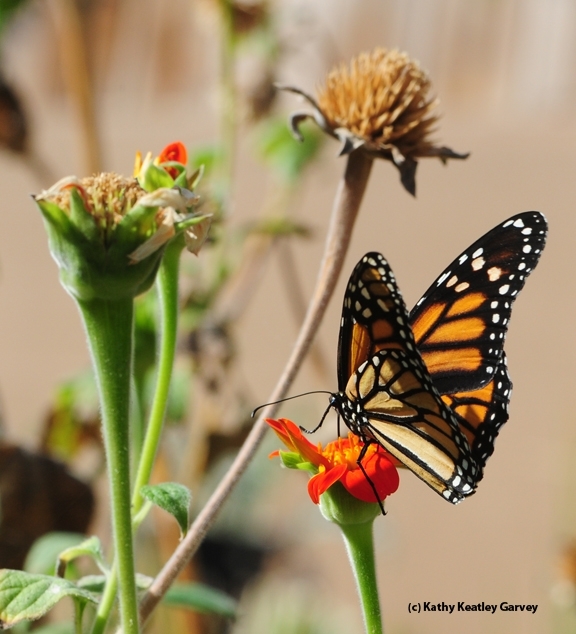 It's a good day when we see a single monarch in our Vacaville, Calif. garden re-fueling for the migration. It's a great day when we see two. It's a super, super wonderful day when we see three. It's a time for cartwheels, handstands and pirouettes. Only a Monarch can get us that excited. 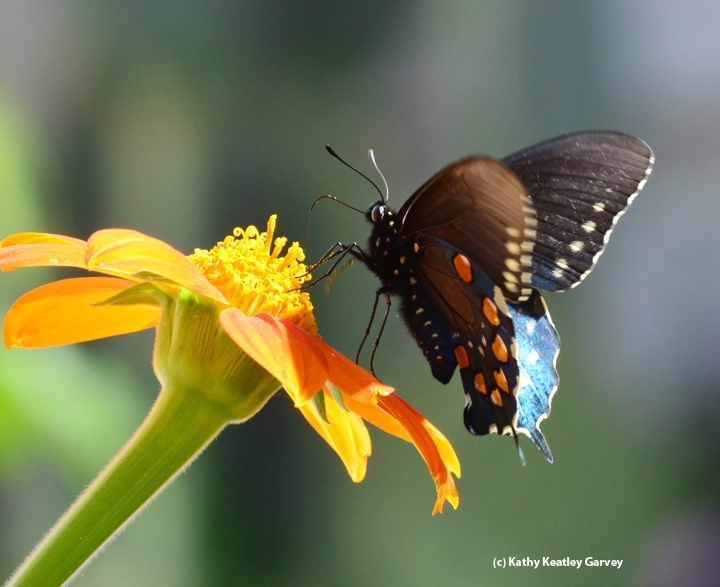 Gulf Fritillaries, Western Tiger Swallowtails, and Anise Swallowtails come close. Mourning Cloaks, Painted Ladies and Acmon Blues? Not so much. The aptly named butterfly bush (Buddleja davidii) draws them all, offering nectar they can neither resist nor refuse. Another nectar favorite in our garden is the Mexican sunfllower (Tithonia). Soon, we hope, two more adults will begin that amazing migratory journey to Santa Cruz? Pacific Grove? Who knows? Right now they're precious jade-green jewels studded in gold. We can see the outlines of the treasures they hold. A passion for butterflies coupled with a yearning to protect their habitat is what drives 98-year-old Louise Hallberg, founder of the nine-acre Hallberg Butterfly Gardens in Sebastopol. Her butterfly sanctuary, a non-profit corporation since 1997, has drawn more than 30,000 visitors, including scores of wide-eyed children and their teachers and parents butterfly enthusiasts, gardeners, and nature lovers. “Over 1000 visitors came on our Open Gardens Day on June 28,” she says. Many visitors come from out of the county, the state, and the country, she said. Louise Hallberg, who will be 99 next January, was born on the family farm. Her grandparents, John and Louise Neta Pearson, initially purchased 40 acres and expanded it to 130 acres, growing hops, berries, cherries, prunes, pears and apples. The oldest of their three children, Alfred, later took over the farm, and he and Della--the one who planted that Dutchman's pipe---raised two daughters, Louise and Esther. “I remember when my mother found the Dutchman's pipevine growing along a country road and brought it here and planted it,” Louise recalls. “Look at it now." 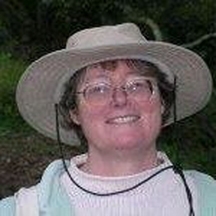 Louise studied at Santa Rosa Junior College and UC Berkeley, majoring in political science. Then she worked 35 years as Santa Rosa Junior College registrar, retiring in 1975. But it was the pipevine swallowtails that continued to spark her interest and what led to the formation of the butterfly sanctuary. She monitors the populations of many species of butterflies, keeping careful records. The numbers keep dwindling but not her passion. On our visit, we enjoyed the ponds, the vivarium, the “secret garden,” butterfly creek, pipevine theater, the woodpecker granary, the meadow garden, and the weather station that her family has monitored and maintained for more than three decades. .We glimpsed the Gravenstein apple orchard and ladders leaning up against the trees, a scene from yesteryear that never changes. "We add new plants (funded by donations) every year," Hallberg says. The Hallberg Butterfly Gardens, in western Sonoma County, are open by appointment for docent-guided tours from April 1 to Oct. 31. 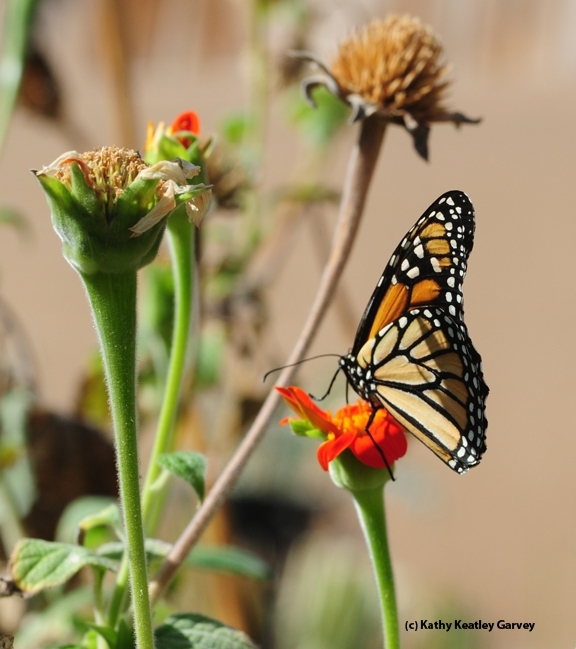 Appointments are offered Wednesday through Sunday, between 10 a.m. and 4 p.m. (Contact the tour and volunteer coordinator (707) 591-6967 or email her at leah@hallbergbutterflygardens.org to arrange a visit.) The non-profit corporation offers books, posters, t-shirts and other gifts. It annually hosts an Open Gardens Day in June that includes a plant sale. Louise Hallberg continues to publish her newsletter, aptly named "The Pipevine." 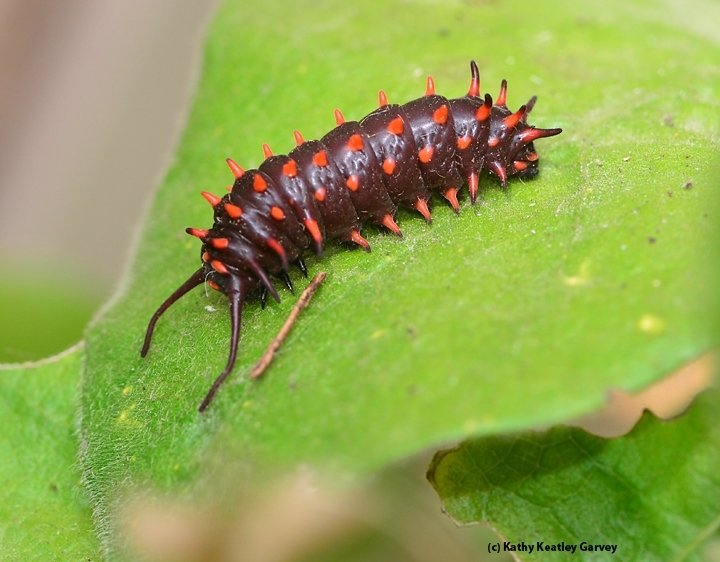 Meanwhile, during our visit, the red-spotted pipevine swallowtail caterpillars went about munching the leaves of the Dutchman's pipevine, while butterflies laid their eggs on their host plants: the monarchs on the milkweed and the anise swallowtails on fennel. 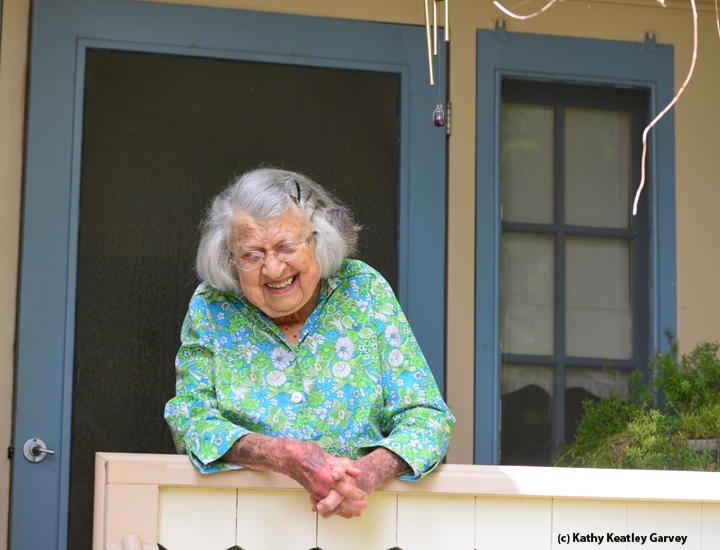 We thought back to the conversation on the front porch with this remarkable 98-year-old "Butterfly Lady of Sebastopol" and her love of the swallowtails, monarchs and dozens of other species of butterflies--and the worries she harbors, not for herself, but for the butterflies. "It's been so hot, so long." "Generally, butterflies are brightly colored on the top side and have dull colors on the underside. The bright colors are used to attract a mate and the dull colors are used to hide from predators." 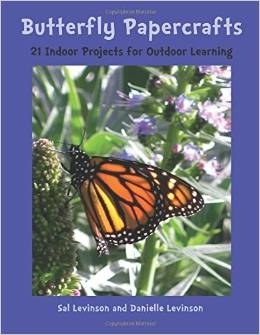 So writes Sal (Sally) Levinson in her newly published book, Butterfly Papercrafts, which contains 21 indoor projects for outdoor learning. Ah, the joys of discovery! If you're looking for something educational, rewarding, timely and artsy-crafty for your kids--and your neighbors' kids--how about teaching them about butterflies? 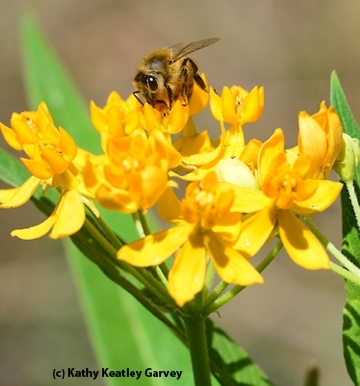 And just in time for National Pollinator Week, June 15-21. Sal who studied entomology at the graduate level at UC Riverside and UC Berkeley, wants to inspire youngsters to learn about our amazing world of butterflies through art and a little science. Each of the 21 papercrafts contains a lesson about butterflies. Butterfly Papercrafts is intended for youngsters ages 5-12, but really, it's also a beginner's book for all ages and a teacher's treasure. And it's priced under $10 ($9.99). 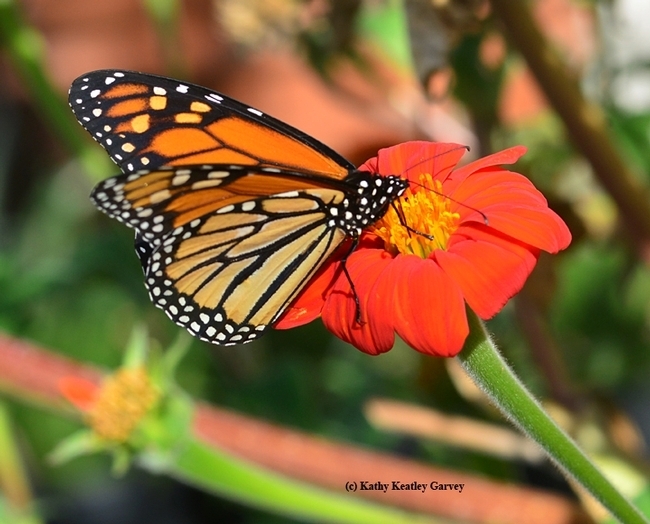 Readers can learn about the life cycle, from egg to caterpillar to chrysalis to adult; and craft a butterfly paper airplane, a caterpillar flip book and a monarch finger puppet. In addition, there's also fascinating information about nectar, pollination, monarch migration, and "puddle parties" (who wouldn't want a puddle party?). She'll tell you exactly what a puddle party is and describe the behavior. There's also good information on how to distinguish butterflies from moths, a question often asked of scientists at the Bohart Museum of Entomology, UC Davis. By the way, the Bohart Museum is planning a "Moth Night" from 8 to 11 p.m., Saturday, July 18, at its location, 1124 Academic Surge, Crocker Lane, and you're all invited. It's free and open to the public. Moths also get in free. Sal has worked with insects from the fields of central California, to the forests of Connecticut and Idaho, to the labs of Berkeley. A butterfly educator for the past two decades, she maintains her own butterfly garden and provides specimens for adult and children's classes, teacher training sessions, and garden fairs. She also writes a blog. Sal and her brother, Bill Levinson, completed two films, In the Company of Wild Butterflies, and The Secret Lives of Monarchs. Sal lives in Berkeley with her husband and, of course, “my insects.” Her daughter, Berkeley resident Danielle Levinson, who illustrated the book, holds a degree in design from UC Davis. Now a software engineer for Google, Danielle remembers growing up with caterpillar terrariums on the kitchen table. And the monarch finger puppet? It's a puppet that appears to have four legs. Sal explains that all insects have six legs, but the monarch, "like all brush-footed butterflies, has two legs that are tiny." "Once the finger puppet is complete, you can use it to mimic butterfly behavior," Sal writes. "For instance, you can take it on a long flight, pretending that it is migrating to Mexico or the coast of California for the winter. Your puppet can bask in the sun to warm up, look for a mate, nectar at flowers, and lay eggs on leaves. At night, it can roost in a protected place. What other butterfly behaviors can your puppet mimic? And the monarch migration chapter? Readers can color trees, the monarchs, and the background. The end result: pop-up art. 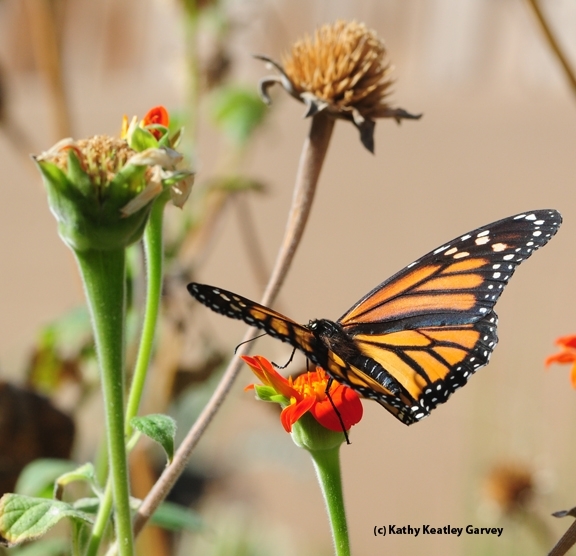 "Monarchs migrate south in the fall and spend the winter in trees along the California coast and in Mexico," Sal writes. "In the spring, they fly north and reproduce." For further reading, she recommends the book, Monarchs by Kathryn Lasky and the film, On the Wings of the Monarch. Caution: Those delving into this papercraft book will (1) become more curious about insects (2) spend a humongous quantity of time outdoors looking for them (3) plant a butterfly garden and (4) rear butterflies. Or become a lepitopterist or artist. Or both.